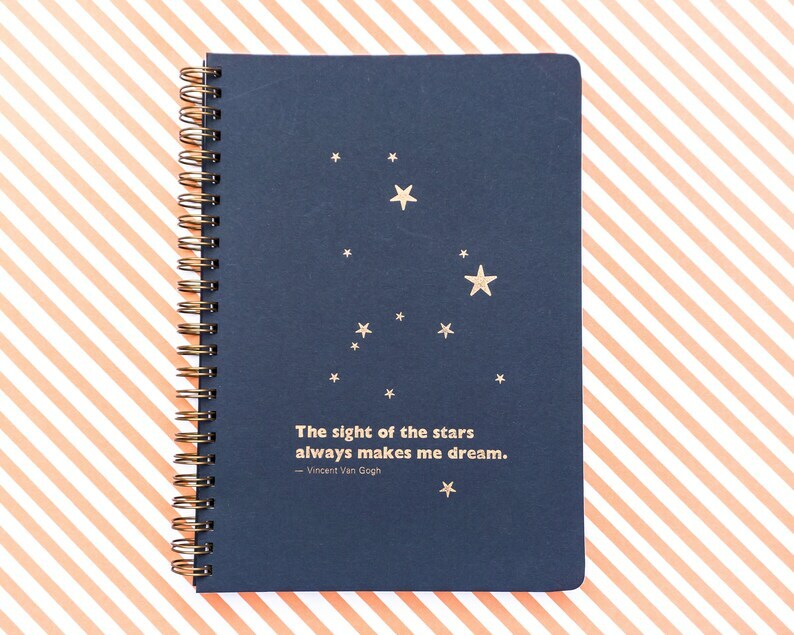 Spiral Bound, A5 size, 60 page notebook with stars and lettering printed on the cover in gold ink. Cover printed by hand onto 270gsm navy cardstock using an Adana 8x5 letterpress, set using vintage metal type and star decorations. Orders will be posted from the UK within three working days. UK deliveries will be sent first class by Royal Mail, international by AirMail. Although every effort has been made to ensure the quality of your product, this is a handmade design and small variations may be found. If for any reason you are dissatisfied, send us a message and we'll try to put it right. Lovely pencil case. Bought for a present but was very tempted to keep it! Very cute little notebook. Delivered on time.